Your wedding, anniversary or vow renewal is not only about a touching ceremony but about a warm, welcoming venue to host the celebration and your vacation. 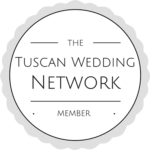 You are choosing Tuscany for the culture, the emotion, and colour of its world-famous sage green and bright yellow hills, walled towns, frescoed halls, bustling city squares, and of course, its rich, genuine cuisine and wines. When we think of VILLAS, we have images of a grand old building but in Italy its definition is a free-standing home. In the age of private rentals like Airbnb, the small villas are becoming venues. If you find a rental place you love for your family vacation, we can see about catering in and decorating on your wedding day to suit your taste. If though you have a larger group, we can suggest romantic Renaissance villas that are ideal for your celebration. Both the ceremony and the reception will flow with the elegance in the special atmosphere of the surroundings.